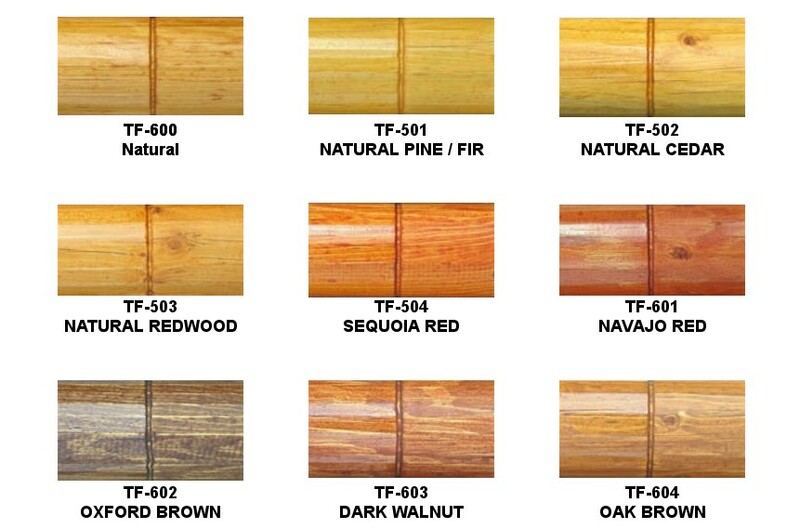 Timberflex is a film forming natural wood finish designed for vertical walls, log homes and fences. The Timberflex system stains and finishes for complete wood protection. On bare wood, it requires at least three coats for proper appearance. The first two coats should be color coats, followed by a clear coat in either a gloss or satin finish. Allow at least 24 hours between coats in good drying conditions. How long will it last and do I need to maintain it? Timberflex should have a maintenance coat applied every two to three years. 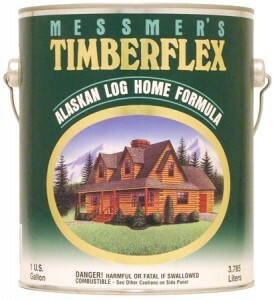 Timberflex can last for years with proper care. Why can’t I have a clear finish without pigment? Clears do not provide color retention. They fail quickly and the wood underneath will gray. We have shaded our clear topcoats with transparent iron oxide pigments to provide extended color retention and protection for the wood, yet maintain a clear natural appearance. What is the best way to apply Timberflex? Timberflex can be brushed, rolled or sprayed. The typical application is to spray on the coating and then back brush or back roll to achieve uniform film thickness. Can Timberflex be applied over another stain? Yes, provided that the surface is sound and clean. Remove any flaking or peeling previous finishes. Do not apply over freshly stained projects or over coatings with stearates, waxes, silicones or teflon. Under good conditions (warm temperatures, low humidity) you should wait at least 24 hours between coats. Cooler conditions or a lack of air movement will require longer dry times. Application of top coats before the previous coat is dry will cause the product to wrinkle and result in poor appearance. Are there any temperature restrictions with Timberflex? Timberflex should be applied when the surface temperature is between 45 and 90 degrees F. Cooler temperatures will cause the product to dry more slowly and require more than 24 hours between coats. On hot days, avoid applying in direct sunlight; this will cause the product to dry too quickly. If the wood is hot to the touch, do not apply Timberflex. Are there any special preparation requirements? Prior to using Timberflex, make sure wood is clean, dry and free from mold and mildew. All cracks and joints must be properly caulked. Timberflex will not bridge or fill cracks in the wood surface.